OK so back to Bangkok, not literally unfortunately as we are now well and truly back in Melbourne but I have a lot of posts to catch up on from our amazing eating and shopping extravaganza in Bangkok. Since returning home of course I am now craving so many of the wonderful dishes we ate in Thailand. Once in particular is Khao Mok Gai which is generally translated as rice deep chicken (at least according to google translate anyway). 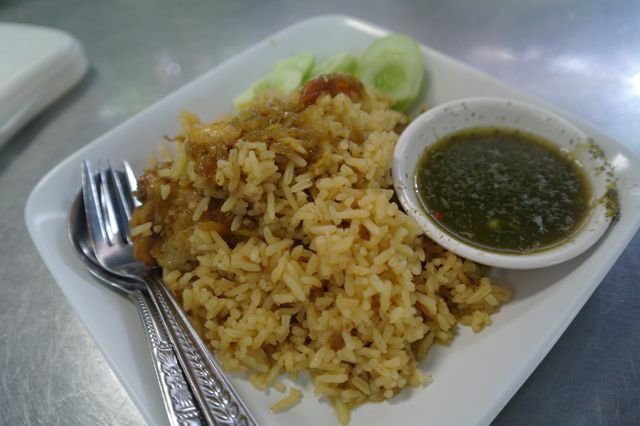 More commonly it is referred to as muslim chicken rice and I suppose you could call it a kind of Thai biryani. Whatever you call it, its delicious! This dish above is actually the Khao Mok Gai and buried underneath that pile of sumptuous yellow rice is a few pieces of beautifully flavoured tender chicken. Although you can't see the delicious chicken that well in the photo I like to think that it actually illustrates the translated name of rice deep chicken pretty well. What I mean is that my take on the translated name is that it is represents a mountain of rice with chicken buried deep within. 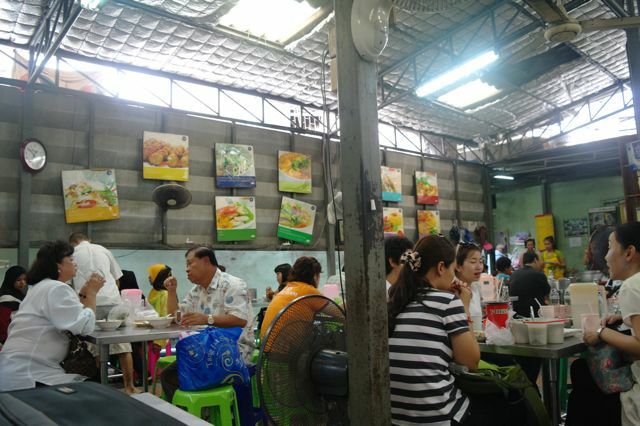 Once again I found this place courtesy of the wonderful 'Bangkok's Top 50 Street Food Stalls'. Having well and truly scoured this little gem of a book from cover to cover I decided to explore the hidden little list of establishments in back of the book that almost made the top 50. Given that there are just so many wonderful eating experiences in Bangkok I was pretty confident that most of these would be just as good as those that made the top 50. In the case of Aisa Rot Dee that assumption turned out to be correct. Finding Aisa Rot Dee isn't difficult really but realising that you have actually found it isn't quite as simple. What makes it tricky is that its just another little pedestrian laneway with a noodle cart in the entrance so you easily dismiss it as not being the Muslim restaurant you're looking for. Fortunately we decided to ask some of the nearby stall holders and it turns out that when you enter the laneway it unexpectedly opens up into a bustling little Thai foodcourt. 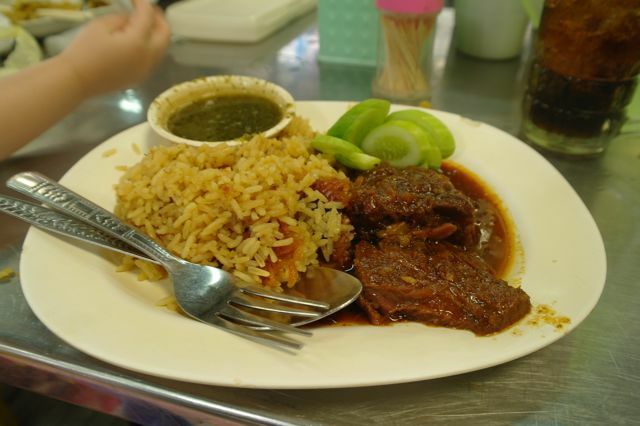 Even better than the Khao Mok Gai (chicken) in my opinion is what I call Khao Mok Neua (beef). The stewed beef in this dish was just amazingly tender with a fall apart consistency that truly melts in the mouth. We were obviously very hungry as was often the case in Bangkok after spending more time than planned actually searching for the restaurant and the beef was so appealing that I just dived straight in and polished it off without realising that I hadn't taken a photo. One of the great things about Thailand is that the serves aren't huge and they are also incredible cheap so the obvious solution was to go an order another serve which I promptly did! Another real highlight of both these dishes is the superb green sauce. I cooked my version of Khao Mok Gai the other night and while it was very tasty it really needs the sweetened vinegar green sauce to take it to the next level. So much so that the very next day I went straight to the internet to find a recipe for the sauce and then cooked the Khao Mok Gai again that night. I must say that the sauce really makes a huge difference in bringing to life a dish that has a lovely earthy flavour. The piquancy of the vinegar sauce, somewhat reminiscent of the Vietnamese Nuoc Mam really makes a difference to the eating experience. It turns out that Aisa is actually the name of the lovely proprietress who has been running this restaurant for many many years. She was very friendly and happy to pose for the photo above. Another really charming thing about a lot of the long established restaurants in Bangkok is the beautiful old photos on the wall of the owners in their prime. 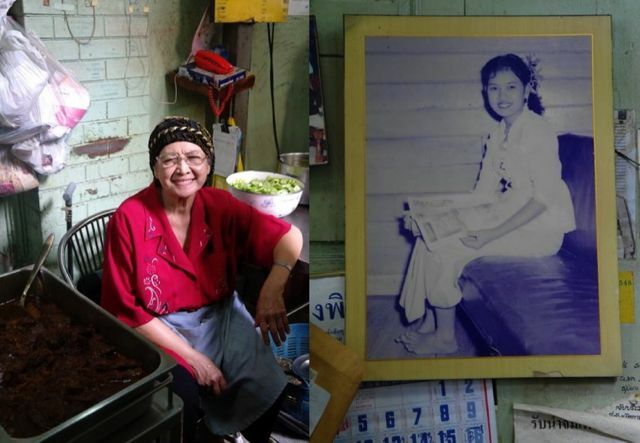 Some of these photos are very old as was the case with Aisa who is now over 60 but still manning the restaurant and chatting happily with customers and readily pointing out the gorgeous black and white photo of her younger self at the tender age of 16. You can't see it in the photo but respect for royalty decrees that the almost mandatory photos of current and past Kings and Queens of Thailand must be hung higher than all other pictures. Hey EVERTHING is better off the main tourist strips especially if it is packed with locals. Even better if they cant speak English and all you can do is point to a faded picture of the dish stuck on the wall :-) Nice post. I totally agree! Another great benefit of the Top 50 book was that I usually had a picture to point to. Fantastic post ... not just on food, but on people, too! Thanks Kenny, it's often interesting when you dig a bit deeper and get the backstory of a restaurant.